I order from you not for the first time and everything went perfectly !!! This time, the order was issued in 2 stores, because the delivery was fundamentally early in the morning …. and again and again you were the first and at the height … delivered very festive, beautiful with warm words .. excited!!!! Thanks you!!! Very attentive and polite staff. At my request, the date of delivery the gift to my daughter was easily postponed. The daughter was touched and I’m glad. Thank you very much! Thank you for delivering the bouquet in Dubai. The prosperity of your company and success in the New Year. It was a pleasure to work with you. From now on we will use your services. Are you looking for the best online florists in Dubai? Why not visit www.upscaleandposh.com — the expert of flower delivery Dubai and see what they have to offer. From Mother’s Day and weddings flowers to corporate events, Upscale and Posh have a variety of flower arrangements to suit your needs. Bouquet is the perfect gift for any occasion, you can send flowers to Dubai to a friend, a relative or the one you adore. Let Upscale and Posh assist you in your floral gifting needs. With so many special occasions still to come this year, Upscale and Posh has the perfect floral bouquets for you. Whether you are looking to buy flowers for a special event, anniversary flowers or just birthday bouquets or perhaps you just feel like showing someone special you care, you can never go wrong with the gift of flowers. The talented florists at Upscale and Posh, would be happy to assist you in making sure that your flower arrangements are perfect for any occasion. Delivery of flowers is a good way to surprise those you love, surprise your boss or colleagues, express gratitude or appreciation. Our flower delivery service in Dubai will help you at any time of the day to surprise your friends and relatives with the charm of the flower arrangement, enjoy the magnificent aroma of the bouquet. The beauty and brightness of the floral palette, the diversity of colors and beauty of every single shade - all this can come true with our local florist. Bouquets created by florists always delight with their uniqueness and originality. Giving gifts gives you a joy, agree? It is pleasant to understand that flower delivery Dubai is the painstaking work of a team of professionals who are trying to present people with more than just a bouquet or a composition. We want to acquaint clients with the riot of colors of nature, saturation and brightness of flora, its unpredictability. Flower delivery will surely convince the addressee of the sincerity of your feelings and wishes. After all, it is customary to give flowers to those whom you value and respect, to whom you want to wish joy or happiness. We seldom think that even the most ordinary bouquet, created from wild flowers, can not just surprise. He can tell about your feelings, “in confidence” to tell about love or admiration. Why you need to choose an ONLINE FLOWER SHOP IN DUBAI rather groceries? Some people prefer to buy bouquets of flowers on the stalls of the market or in stores, without worrying about the fact that flower delivery is more profitable, reliable and cheap. Flowers that are used in the market to create a bouquet, stand in vases for a long time, fueled by special means. Our florists use only fresh cut flowers, which for a long time remain beautiful, neat, with fresh buds. Our prices always delight customers because we are affordable flower shop! Often there are such situations when there is not enough time to go even to the nearest shop and choose a bouquet. It gives the opportunity to give flowers to person you like, leaving the sender's identity in secret. We, at Upscale and Posh have only professional & experienced florists, who value their reputation. In our flower shop website you will find not only classic, but also the most exotic flowers for any occasion. Here you will be rescued by an online flower shop. Many delivery services work around the clock, and, as a rule, it is possible to receive a bouquet on the day of order. For you there is only a small part: choose the most beautiful option and place your order. Flowers will be delivered at the right time and place, which will significantly save time and effort that you still need for other important tasks. The person who received the bouquet will not know who sent this gift, unless you yourself later confess. Delivery of flowers to the house incognito is covered with a veil of mystery, and by attaching a mysterious note to the bouquet, you can awaken extraordinary curiosity. Anonymous flower delivery in dubai is good at the beginning of the “candy-bouquet” period, when you have little knowledge of a lady and want to “warm up” her interest. Do not worry about the security of your data: order information is not available to third parties. Our florists create bouquets just before delivery, so you’ll have only fresh flowers! Therefore, our bouquets stay fresh for a long time, but only delight the eye with its beauty. When you make an order flowers online, you can follow the execution of the order from its registration to the time of delivery of flowers to the specified location. In this case, you can receive a photo with the delivered bouquet and make sure that the recipient received your gift. In addition to flower arrangements, you can choose a soft toy. At the same time, it will be easy to make a choice: there are always subsections on the websites, where both traditionally female gifts and men’s presents are presented, as well as sets created especially for children. Flowers always give a special person, so the bouquet must certainly be special. Order a FLOWER BOUQUET DUBAI — to please, surprise and delight! Do you want to give your loved ones indescribable emotions and feelings? Want to give joy, emphasizing the importance of the event? Just order flowers in Dubai that your relatives, acquaintances or friends like. Flower delivery will definitely be a surprise for a girl who is waiting for a loved one with a banal gift, and will receive chic flowers with a card. It is sure to touch the tears of parents who have missed their children and have not seen them for a long time. Let you fail to often meet with mom and dad, but you can please them with original bouquets at any time! You can choose flowers for Women's Day (8th of March), a bouquet for Valentine's Day Gifts, or order a bouquet right now, which will be quickly delivered to the door of your family. Imagine the happy face of the mother and the contented smile of the father, not expecting to see such a miracle! Let your loved ones feel your love, your sincerity, your warmth, let the flower delivery be the most vivid impression, the most memorable event! Flower delivery to Dubai is a great opportunity to say with flowers everything that you have long wanted to say out loud, but did not dare! Why are ONLINE FLORISTS IN DUBAI Better Than Standard Florists? Just 2 words — #1 — INEXPENSIVE, #2 — FAST. Most of us live busy lives and as much as we would like flowers in our home or office we simply do not have the time to visit the nearest supermarket or local flower shop to buy flowers. 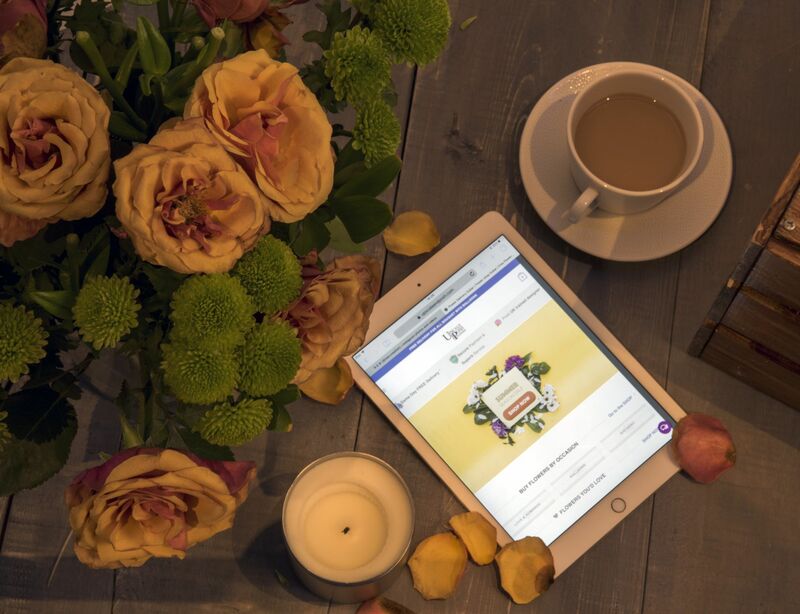 An online flower shop solves this issue by making it easier for you to browse flower arrangements online at your desk, making the selection, ordering and delivery process much easier for you. Send flowers to those you care about without having to worry about choosing the right bouquet or delivering the flowers in time. Online florists will take care of all your floral needs for you. With flower delivery in Sharjah as well as in Dubai, ordering flowers never seemed so easy. With so many floral varieties to choose from, you can give the gift of flowers to anyone you value, from your grandmother to your favorite niece, to the love of your life — the florists at Upscale and Posh can design many flower arrangements. And what is most important — you can get these affordable and cheap flower delivery in Dubai without breaking the bank! Why don't have a look at the floral selections on the website and see which one appeals most to you. Upscale and Posh are also happy to design bespoke bouquets to your preference so you can send flowers that are entirely to your taste. After all, a birthday without flowers is almost as bad as a birthday without cake. Keep the sweetness and beauty alive on your loved one’s special day and see the selection of cakes that Upscale and Posh can deliver too! Give the best birthday gift by sending a cake along with some flowers and be the gift giver of the year! What better way to surprise someone then to give them a beautiful floral arrangement or Valentines Same Day Flowers. Upscale and Posh prides themselves on being the best online florists in Dubai. Among the best ways to show someone you love and cherish them is to present them with an excellent bouquet of awesome and intricate flowers. Are you for an amazing bouquets to present your beloved? The outstanding florists at Upscale and Posh will assist you to design a beautiful bouquet that will make any occasion feel and look more special.